BioMar har identifierat ett marknadsmöjlighet för en hållbar premiumräka. Det tillkännagavs i veckan i samband med Global Aquaculture Alliance:s årliga konferens, GOAL. De kommer att samarbeta med räkbönder i Ecuador för att realisera denna hållbara innovativa produkt. BioMars globala hållbarhetsdirektör Vidar Gundersen deltog i flera diskussioner under GOAL-konferensen där han delade sin inblick i hur andra odlade arter har låst upp nya marknader och affärsmöjligheter runt om i världen. Han gav exempel på hur BioMar i samarbete med andra i värdekedjan kunde bygga hållbara varumärken inom lax. "BioMar är fortsatt engagerad i hållbarhet och det arbete som vi började för ett decennium sedan. Vi kan ta lärdomarna från andra arter och tillämpa dem för att skapa ett verkligt hållbart räkval för återförsäljare och slutkonsumenter. Vi hoppas kunna initiera nya projekt med våra kunder, vilket kan påskynda utvecklingen av högvärda räkprodukter ", säger Vidar. BioMar has identified a market opportunity for a premium, sustainable shrimp product. 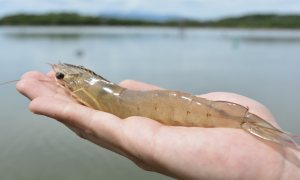 They announced this week in connection with the Global Aquaculture Alliance’s annual conference, GOAL, that they will be collaborating with shrimp farmersin Ecuador to bring this sustainable innovative product in to reality. BioMar’s Global Sustainability Director, Vidar Gundersen took part in several discussions during the GOAL conferencewhere he shared his insights on how other species of aquaculture feeds have unlocked new markets and business opportunities around the world. He gave examples of how BioMar in partnership with others in the value chain were able to build sustainable brands within salmon. “BioMar remains committed to sustainability and the work we started a decade ago. We can take the learnings from other species and apply them to create a truly sustainable shrimp choice for retailers and the end-consumers. We hope to initiate new projects with our customers, which can accelerate the development of high value shrimp products”, said Vidar. Sustainability and raw material sourcing are hot topics throughout the entire seafood value chain as consumers and retailers look for more sustainable options. Ecuadorian shrimp is well positioned to leverage this opportunity. Vidar Gundersen lead the development of BioMar’s sustainability platform BioSustainTM, the only program in aquaculture with successful collaboration partnership projects that have opened new markets and grown new business opportunities. “Our sustainability journey began more than ten years ago. Through a meticulous method of evaluating each raw material in terms of environmental footprint as well as nutritional benefits, the products are designed to meet consumers’ requirement for healthy and sustainable seafood”, explains Vidar. “BioMar has placed a high priority on the shrimp industry with our recent acquisition of Alimentsa in to the BioMar family. We are committed to driving real sustainable change that will benefit the entire value chain. This is why we are directing resources not only towards industry initiatives like SSP but also to new innovations with the establishment of the BioMar Aquaculture Technology Centre in Ecuador which will open very soon”, concluded Henrik Aarestrup, Vice President, Emerging Markets BioMar.